Ryley is finally on the mend and is pretty much bored out of his brains. This is ALWAYS a good sign though, so I am actually relieved to have him whining and wanting to do something! It is far too cold here now for him to be outside so I decided to make some playdough and see how long that would keep them amused. Turns out it keeps them occupied for over an hour! 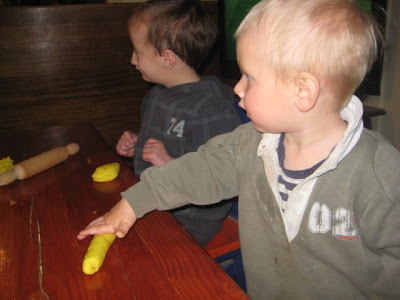 Ryley is really good at rolling the playdough into a long snake. I help him poke his fingers in, and he is getting better at squeezing. Braeden loved eating the playdough and squishing it and using a plastic knife to cut it up and stab it. School holidays here now, so the kids are going to have love playdough a whole lot more!! Ryley has been battling a fluey bug for a couple of weeks again now. Poor kid has spent the last few nights awake coughing. So he has missed the last two days at school. Lucky it is the end of term I think! Poor kid. This time of the year is so hard for him. As soon as he gets a cold/cough it just gets worse and worse. For the first 3 years of his life he used to spend time in hospital with pneumonia. Luckily he built up a bit of immunity so hasn't had to be hospitalised for chest infections for the past 4 years or so. But I guess given the fact that he is more prone to respiratory illness we have to be really careful. Plus his whole body system works differently now due to the KD so the poor kid just battles and battles. I wish he could get a break from feeling like crap all the time. Time to start avoiding sick people like the plague for a while I think. It is hard to avoid coughs and colds, but if we can, then we definitely need to! The one who can do no wrong. He is 'neurotypical'. Developing normally. And he is the one who doesn't miss a single thing. He watches as I struggle to get Ryley into his carseat. He jumps into his without a word. Waits patiently, anxiously, with a worried frown on his face. He is relieved when finally Ryley is clicked in. He passes Ryley his cup. He almost is saying: take this cup and sit down and behave, stop being naughty. He knows that Ryley needs help with most things. He brings his shoes out for him, tries to put them on his feet. He brings out nappies, he offers his food. He only protests a little bit when Ryley takes his balls/books/anything. When Ryley won't take his medicine. Braeden asks for medicine. He knows Ryley will take his then. He knows when it is all too hard for his Mum. And he snuggles in and strokes her hair and asks for "there", which is his breastmilk. How can the one event that changed Ryley's life be the cause of such a contradiction? The Ketogenic Diet is something I haven't written specifically about yet, and I don't plan to do it in this post. Those close to us will know that starting this diet was the last resort for Ryley. There were no more medications to try. We had tried them all. We were hedging all our bets on the diet working. But at the same time we didn't dare believe that it would. A 50% reduction in seizures? We prayed that this would be our outcome. 50% of 400 is only 200 right? We would have been happy with this. It would have meant at least some relief for Ryley from the constant seizures plaguing his tiny little body. We hoped for a miracle. Held our breaths as we wished and wished and wished. Better than we could ever have hoped. At the start of the footy season (AFL) David and I agreed that whoever wins out of Carlton and St Kilda will be who Braeden barracks for. 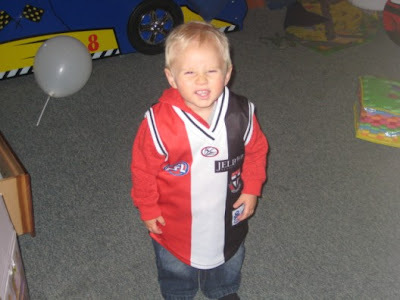 I barrack for Carlton (BLUES) and David and Ryley barrack for St Kilda (SAINTS). Last night the Saints won (only because Judd had a broken nose though!). It didn't take long for all the footy gear to come out. This was where I found Ryley the other morning. I had gone to get dressed and get the kids clothes out so I could dress them for school and daycare. It had gone suspiciously quiet and when I went to look for them, this is where I found them! 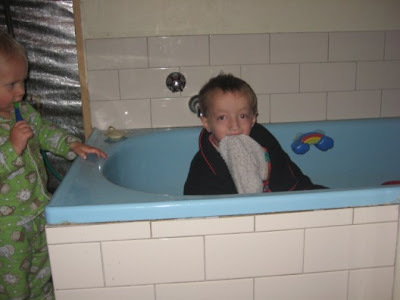 Ryley had climbed into the bath on his own! We know he loves the bath, but jumping in with his clothes on...?? Very funny and very clever! He was quite proud of himself too! As we rapidly approach the one year mark of Ryley being on the Ketogenic Diet, I have been busy reflecting on the journey that is Wolf-Hirschhorn Syndrome. For those who never got to read Ryley's first blog, you are probably unaware of the whole diagnosis process that we undertook. So I thought I might revisit the beginning and reflect on what has become our very beautiful life. Ryley was born at 40 weeks. I had spent the previous two weeks in hospital with pre-eclampsia and was being closely monitored. The doctors were reluctant to induce me before my due date because Ryley was 'small for dates'. I was finally induced and after a very traumatic birth (even thinking about it still makes me want to cry), Ryley Jack arrived into this world on the 5th Febuary 2002. He weighed 6lbs 7ozs and was 49cm long. Not so small after all! 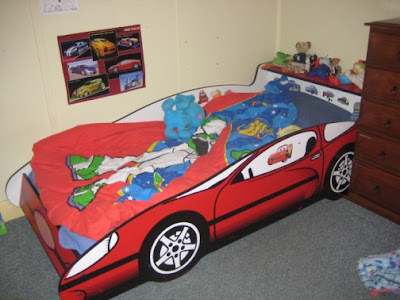 We finally relented on the weekend and bought a car bed for Braeden. Our current sleeping arrangements are this: Braeden and me sleep in the spare room and Ryley and David sleep in our room. This is mainly because it has just been the easiest set up. Braeden still feeds umpteen times a night, and Ryley also wakes often. But it is something that we can't have forever. The top picture is Ryley's bed, and the bottom one is Braeden's. Ryley has had his car bed for years and sometimes sleeps in, sometimes doesn't. Depends on how he is feeling. Braeden did sleep for a couple of hours in his bed at least, and Ryley slept the whole night last night (that doesn't happen very often!). The plan is to ease Braeden into his own bed gently. There is no rush.